Breakfast is that one meal you should really eat each day. My mornings are usually a rush to get myself showered and presentable, get the dog fed and outside for potty time, and make sure the chickens have food and water. I could rush less if I got up a little earlier, but I’d rather sleep in a little longer. Those precious extra minutes help to make me a pleasant human. Otherwise…you don’t wanna know. That being said, breakfasts on a weekday consist of cereal, a couple of eggs and an english muffin and coffee, or recently, a smoothie. Saturday and Sunday I usually put in extra effort for breakfast. Percolated coffee. Bacon or sausage. Fresh made pancakes or Belgian waffles. Biscuits and gravy. Quiche. Not all of those items at once, but a mixture of them, making breakfast more of an event rather than just food for nourishment. Enter in the invention of my Strawberry French Toast Bake. I like to keep a couple of baguette cut into sandwich sized chunks in the freezer. They freeze nice, thaw quickly, and are great for impromptu guests or invites to a party where I will take an appetizer. And, they make for amazing french toast. I had a whole one, unfrozen just hanging around and was in the mood for french toast. But I wasn’t in the mood to soak those little rounds and make a bunch of 3 bite french toasts. I wanted something quick, simple, and hearty. I also wanted something with berries. Whenever strawberries go on sale, I buy a bunch and then cut some up into cubes, freezing them for later uses. The berries took it to another level. Served with some bacon it was a very filling breakfast. This recipe will easily serve a family of 6. Hubs and I had it for breakfast on a Sunday, and then throughout the week. It’s fantastic. A must make. Grease a baking dish (I used a heart shape that was roughly 9×9). In a bowl, combine eggs, milk, spices and vanilla, whipping to combine. Sprinkle some of the strawberries on the bottom of the baking dish. Add in your bread chunks. Scatter the rest of your strawberries all over the top. Pour on the egg mixture, being sure to coat all of the bread. Preheat your oven to 350 degrees. 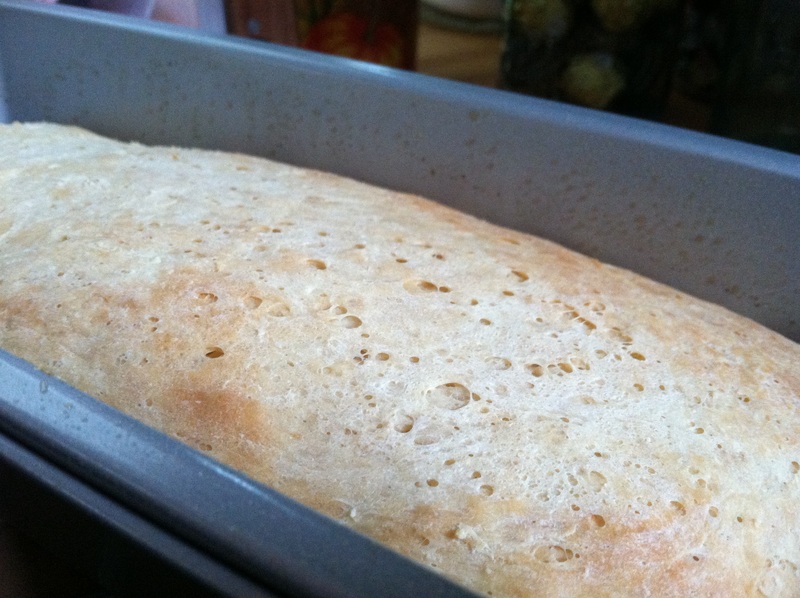 While your oven is preheating, you’re going to let the bread soak up all that egg mixture. Bake for 35-45 minutes, until top of the french toast bake is golden brown, and the center is set. Serve immediately with butter and maple syrup. Chewy inside, crispy outside, with a swipe of cream cheese getting all melty from the heat. Oh yes. Bagels. But not just any bagels, HOMEMADE bagels! 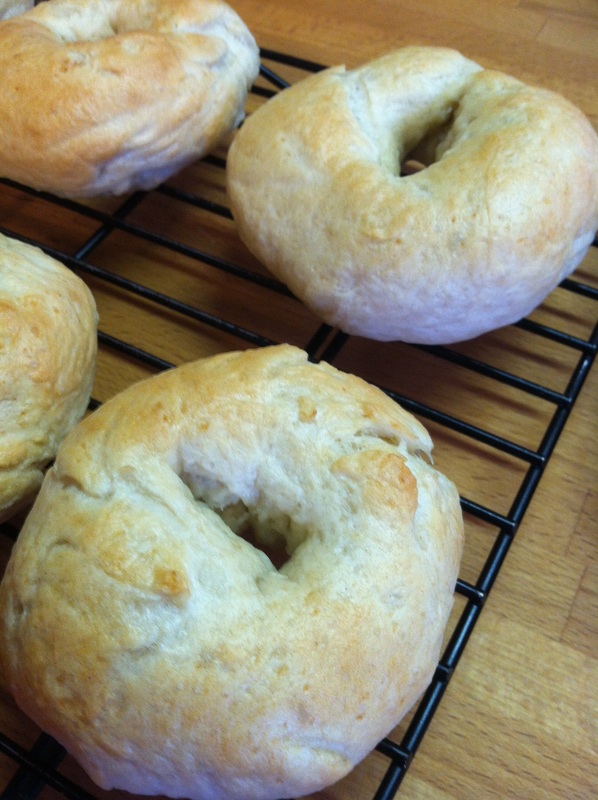 Homemade bagels that are quick and easy to make. Yes, I had to eat one right out of the oven. I was just making sure they were edible of course. These also are great from the freezer. I sliced them from side to side, leaving a little bit unsliced in the center of the bagel to keep the two halves together. You’ll want to do this prior to freezing so they can be easily popped into the toaster. If you are anything like me and like bagels as much as I do, make a double batch, and freeze half of them. It’ll be like Christmas morning all over again. In the bowl of a stand mixer fitted with the paddle attachment, add the flour, sugar, yeast and salt. With mixer on low, slowly add the water. Continue to mix until the dough comes together, about 4-6 minutes. Swap the paddle attachment for the dough hook and knead on medium-high until dough is smooth, about 8-10 minutes. take dough out of the bowl, spray down the bowl with nonstick cooking spray or gently wipe in olive oil and add dough ball back. Cover with a towel and let rise for 1 hour or until doubled in size in a warm place. Punch down the dough and let the dough rest for 10 minutes. Preheat the oven to 425º F and bring a large pot of water to a boil, reduce it to a simmer. Divide the dough into 8 pieces. Roll dough into balls, rolling the balls between your palm and the work surface, until the are smooth. Poke your finger through the center of the ball creating a ring. Twirl the ring around the index of one hand and the thumb of the other, stretching the dough and widening the hole to about 1/3 of the bagel’s diameter. Place the bagels on a baking sheet lined with parchment paper or a silpat mat and cover with a towel, letting them rest for 10 minutes. Gently lower the bagels into the water in batches, 4 bagels at a time. Boil uncovered for about 1 minute on each side. 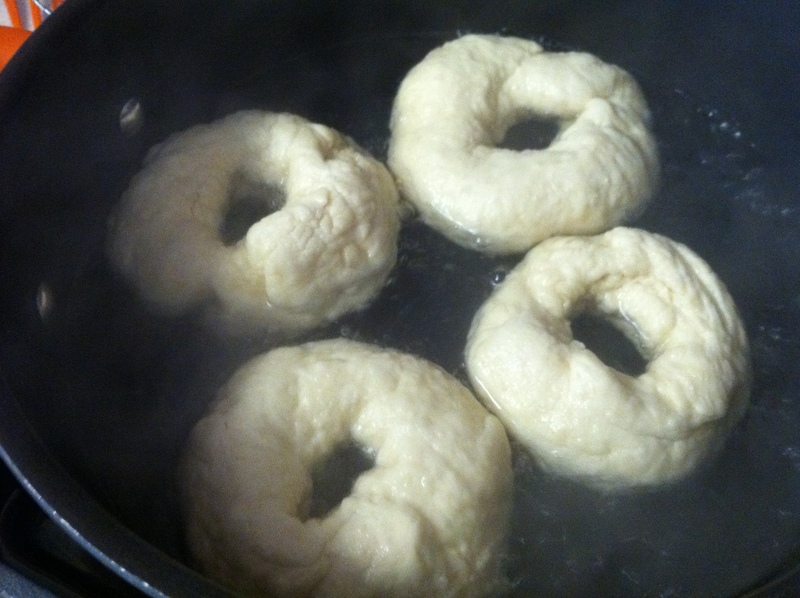 Using a skimmer, remove the bagels from the pot, shaking to drain any excess water – return to the baking sheet. Bake for 20-25 minutes or until golden. Transfer to a wire rack to cool completely before storing in an airtight container to preserve freshness. Are you an english muffin addict? 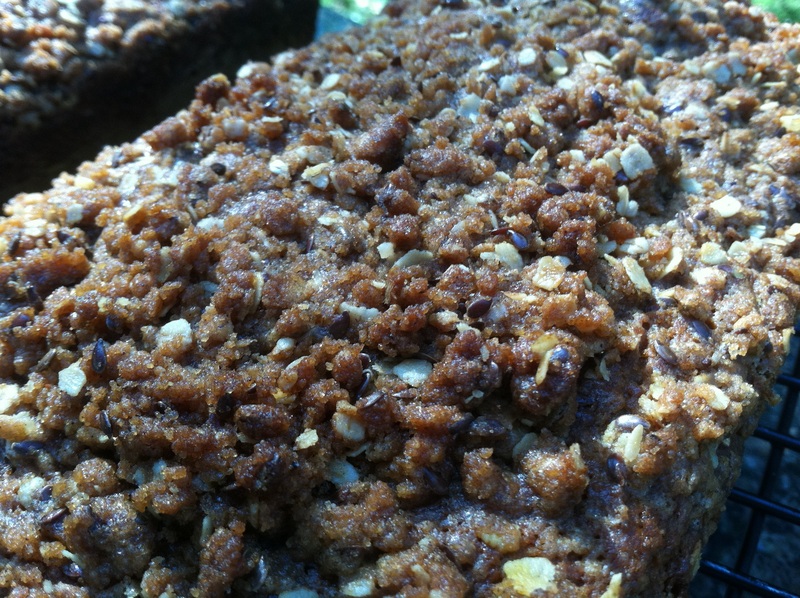 Try english muffin BREAD! Ah, the english muffin. The nooks. The crannies. That chewy soft interior with the crunchy exterior. Now, in walks english muffins, in bread form. There aren’t any nooks. Or crannies in the bread. But it’s totally ok. Trust me. Butter and jelly melt into this bread after you toast it. It’s bliss. It’s great at breakfast. 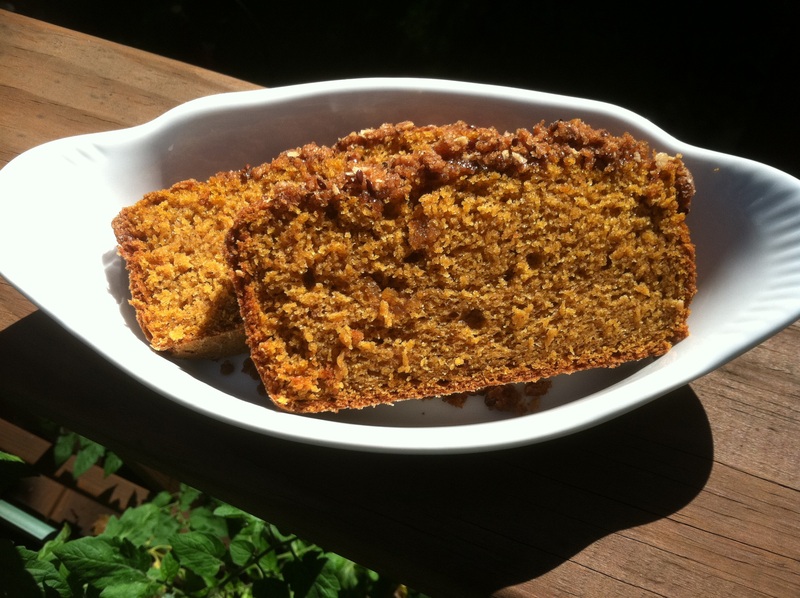 It’s also great to have as a sandwich bread for egg salad or turkey. Or grilled cheese. Ya, it’s that good. Now, this is not full size pieces of bread like a sandwich loaf – it’s more half a piece of bread. So 2 pieces = 1 piece of bread. It freezes fantastically. I always freeze one loaf after it cools since it takes us a few days to eat the first loaf. Store in a sealed container on the counter for 4 days, or in the fridge for one week. If it lasts that long. Heath the milk and water in a small saucepan until it reaches 125 degrees. Lightly grease two loaf pans. Sprinkle cornmeal over the bottom of the pan, shaking out any excess. In a large bowl, mix together 3 cups flour, yeast, sugar, salt and soda. Stir the heated milk and water into the flour mixture, stirring until all dry ingredients are incorporated. Stir in the remaining flour, 1 cup at a time (last addition being 1/2 cup), until a batter like dough is formed. Divide dough in half, shaping it into prepared pans. Spray top of bread with cooking spray then loosely place a piece of saran wrap over the pans. Cover with a dish towel and let rise in a warm place until nearly doubled in size, about 1 hour. Preheat oven to 400 degrees. Bake until golden brown, about 25 minutes. Remove from pans and cool. 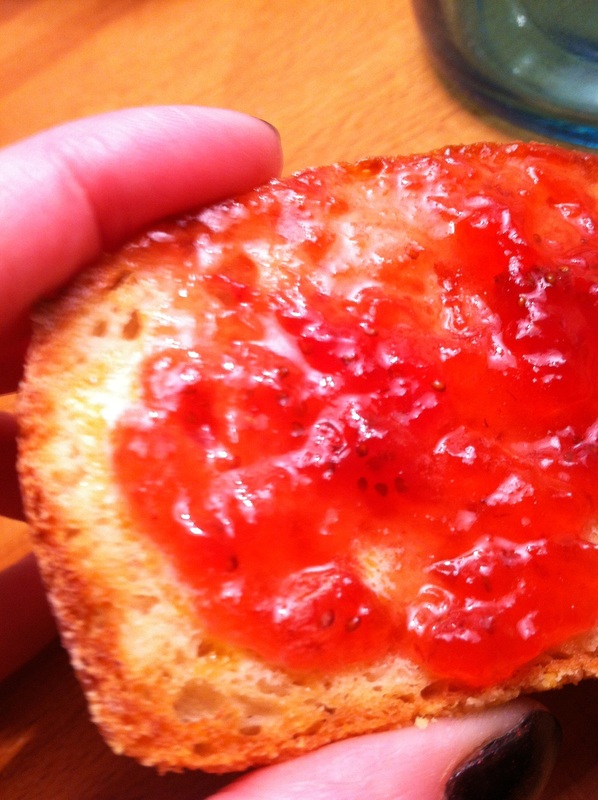 Yes, I ate a piece at night with some homemade strawberry jam. and butter. it was divine! I love – I mean LOVE all things carbohydrate. I will tear up some pasta. I will gorge myself on a bread basket with butter, dipping oil, or just bread by itself. If there were meetings for people addicted to carbs, and I was a quitter, I would need the 12 step program to get off the carbs. But i’m not a quitter so even if there was a program for folks like me, I’d not be in line to sign up. Seeing as how I love bread, it made sense for me to purchase “artisan bread in 5 minutes a day” – the title had me. Bread, in 5 minutes a day? No knead/rest/knead/rest/bake??? 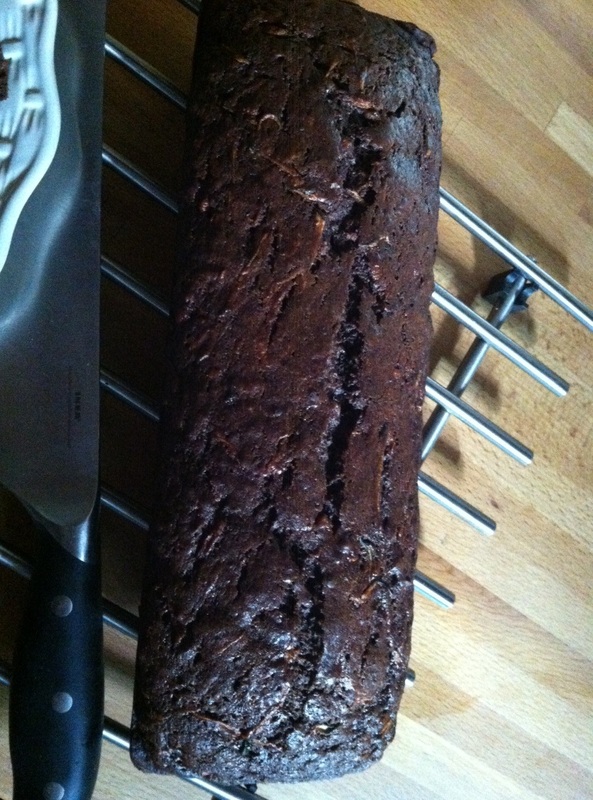 No complicated ‘sponge’ to make a nice, bakery shop worthy loaf of bread? Sign me up! This particular recipe will yield four 1lb loaves of bread. You can either let this dough sit in the fridge in a large container (not airtight) and pull out a chunk when you want to bake it, or do as I did and bake all at once – I’m glad I made all 4 loaves at once since we consumed 1 1/2 loaves ourselves the day I baked them! They do freeze great as well, just double wrap in plastic wrap once they are completely cooled. Use or freeze all of the bread within 7 days. I have no idea why it’s called “Vermont Cheddar Bread” unless they use actual cheese from Vermont, or they are baking it in Vermont. I made mine in Pennsylvania so that’s what it’s called! And if you get a chance, purchase this book. It’s full of great advice and tips, and you will look like a baking pro! 1. In a large bowl or food container, mix the water, yeast, salt, and sugar together. Stir in the flour and grated cheese until just combined; you may have to use your hands to incorporate the last bit of flour. Alternately, use a food processor with a dough attachment or a standing mixer with a dough hook to combine ingredients. Do not knead the dough. 2. Cover the container loosely with a towel or plastic wrap. Let the dough rest at room temperature (65 to 75 degrees) for 2 hours or until the dough rises and collapses. 3. The dough is now ready for baking, but it’s easier to handle after refrigeration. Refrigerate in a loosely covered container for up to 7 days. 4. When ready to bake, have ready a pizza peel or baking sheet dusted liberally with cornmeal. 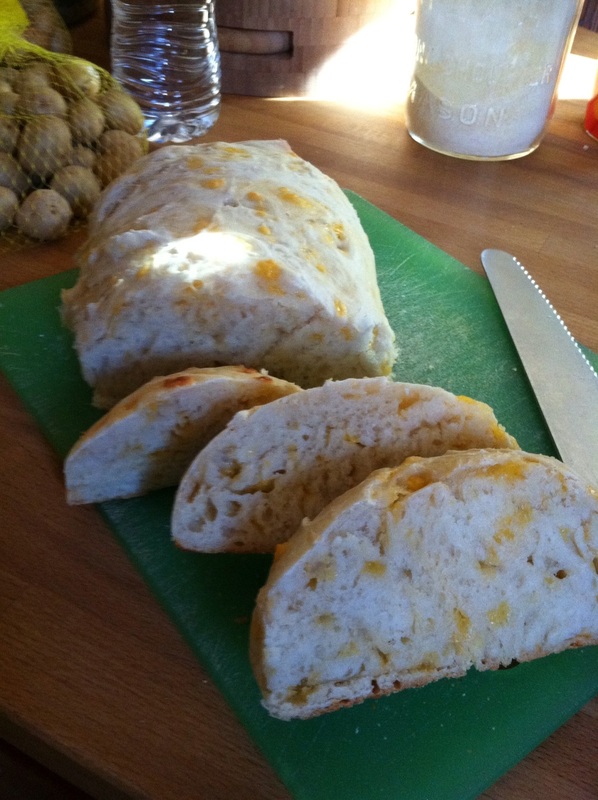 Sprinkle the dough generously with flour and cut off a 1 pound piece (about the size of a grapefruit) for each loaf. Sprinkle the piece with more flour and quickly shape it into a ball by stretching the surface of the dough around to the bottom as you rotate the ball in your hands. Place the ball of dough on the pizza peel or baking sheet. Let rise at room temperature for 1 hour (40 minutes if you’re using fresh, unrefrigerated dough). 5. Set the oven at 450 degrees. Place a baking stone or baking sheet on the lowest rack and an empty broiler tray on any other shelf that won’t interfere with the rising bread. 6. Sprinkle the loaf generously with flour. Using a serrated bread knife, quickly slash a cross or tic-tac-toe pattern across the top of the bread. 7. 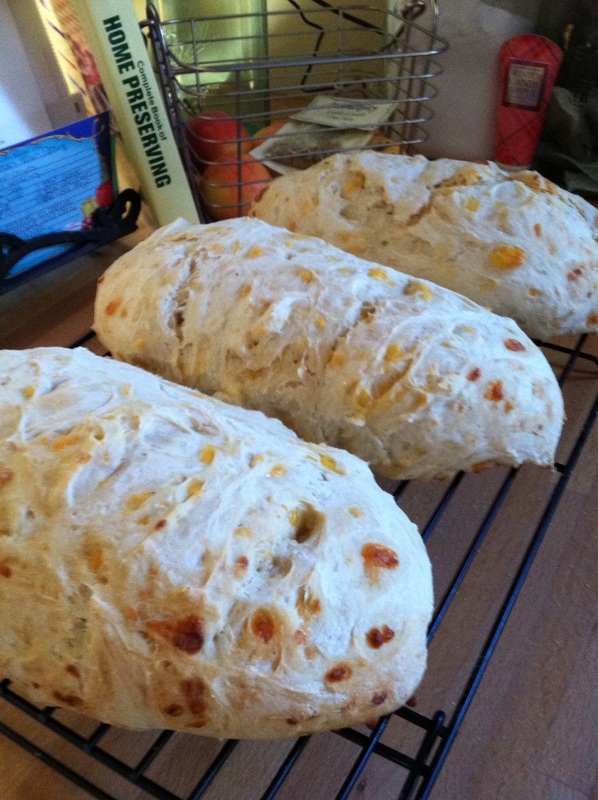 Slide the loaf of bread off the peel or baking sheet onto the hot pizza stone or baking sheet. Pour 1 cup hot water into the hot broiler tray. Quickly close the oven door. 8. Bake the bread for 25 minutes, or until it looks deeply golden and firm. 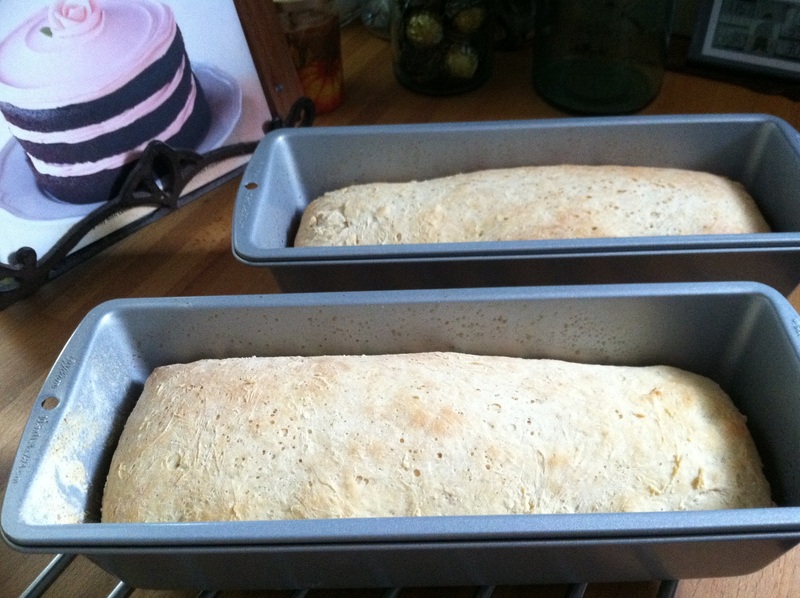 Smaller or larger loaves will require more or less baking time. Cool on a wire rack before slicing. Homemade pizza dough means perfect homemade pizza crust, calzones, or breadsticks. Pizza. It’s great for any time of year. It can be a quick meal. Great food to feed a crowd. Goes well with an ice-cold beer on your deck in the summer. You can top the dough with whatever your heart desires. But great pizza is only as good as the crust you put your ingredients on. Inferior crust leaves you feeling cheated somehow. Enter in the most perfect pizza dough recipe ever. Thank you Cooks Illustrated. In the bowl of a stand mixer fitted with the paddle attachment, combine the bread flour and salt, mixing briefly to blend. With the mixer on low-speed, pour in the yeast/water/oil mixture. Mix until a cohesive dough is formed. Switch to the dough hook. Knead on low-speed until smooth and elastic, about 5 minutes. Transfer to a lightly oiled bowl, turning once to coat. Cover with plastic wrap and let rise until doubled in size, 1½-2 hours. Press down the dough to deflate it and transfer the to a lightly floured work surface. Divide into two equal pieces. Form each piece of dough into a smooth, round ball. Cover with a damp cloth. Let the dough relax for 10 minutes. To bake, preheat the oven and your pizza stone to 500˚ F for 30 minutes. Transfer the dough to a piece of parchment paper lightly sprinkled with cornmeal. Shape the dough and brush the outer edge lightly with olive oil. Top with whatever your heart desires. Bake until the crust is golden brown, and cheese is bubbling, 8-12 minutes. One ball of dough will make 2 calzones. Roll dough out on parchment sprinkled with cornmeal and cut in half. Fill with desired ingredients (I make one with ricotta, artichokes, spinach, shrooms and smoky cheddar. Another with ricotta, mozzarella, pepperoni, hot peppers, shrooms and sauce) leave outer edges clear so that you can fold the topping in. 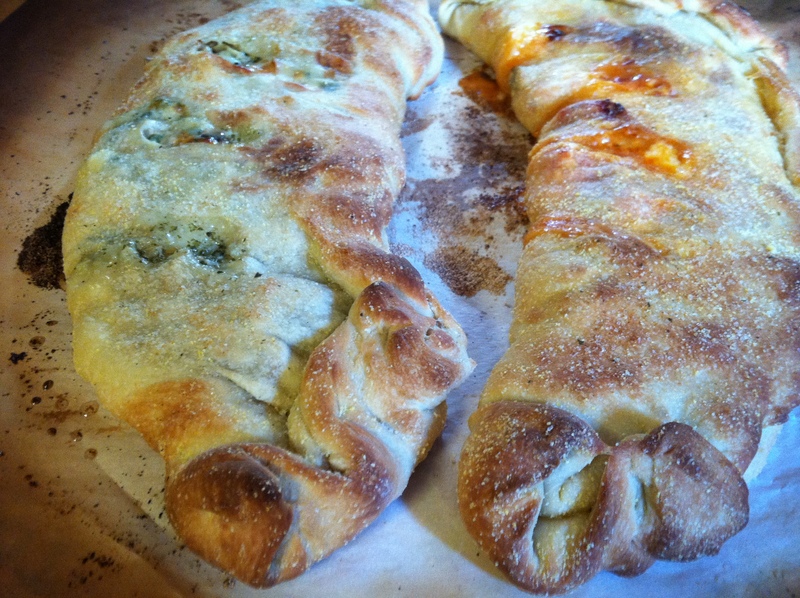 Fold over edges, pressing to close, and brush entire calzone with olive oil. Sprinkle with garlic salt. Score calzone so steam can escape. Put in 500˚ F oven on preheated pizza stone for 20 minutes until golden brown and bubbling. Note: to use frozen dough, take out of freezer and thaw the night before in the fridge. Or remove from freezer and thaw on the counter for a couple of hours the same day.